Christmas has finally come to the Wizarding World of Harry Potter in Orlando. This year Universal Orlando has completely redesigned their Christmas offerings, making it the biggest shake up of their holiday event in the park's history. There's an all new parade, tons more holiday entertainment and a projection show like you've never seen before. Universal's Christmas has always been centred around family fun and now with the introduction of Christmas in the Wizarding World, it's got even more magical. For the first time since it opened in 2010, Christmas has finally come to the Wizarding World of Harry Potter. There's plenty to see and enjoy from the decorations, to the new performances and of course the Magic of Christmas at Hogwarts. 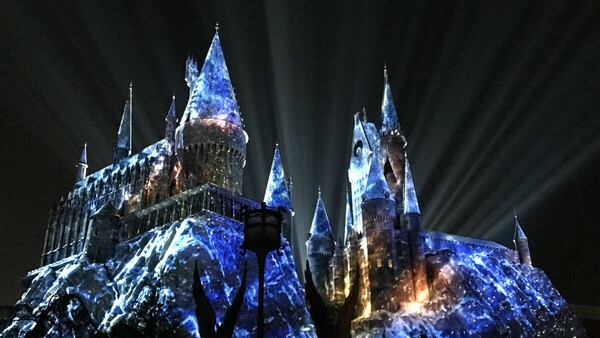 Universal promised that this would be ever Harry Potter fans' dream, because Christmas and the Wizarding World go together like Butterbeer and Chocolate Frogs. Universal has worked with Macy's for the past 16 years to create their parade, but this year's has been completely redesigned. There are brand floats and balloons, all themed around either Father Christmas or Universal owned animations. Even though the parade route is the same, this is not simply a smaller version of Macy's own New York event, this is something completely unique to Universal Orlando Resort. Old favourites have also returned this year too. That pesky Grinch is back in Seuss Landing causing mischief for the festive obsessed Who's. He has his own stage show and even a character breakfast.